The New Year is the perfect time to get into shape following the indulgence of the festive season. And what better way to get fit than taking in the splendour of Calderdale on a scenic walk. The Courier’s new walking column will showcase the best of the district’s walks. Pick up a copy of this week’s paper for the first route, which explores Midgley Moor and Mytholmroyd. There is also a handy guide to organised walks coming up in Calderdale, but we need your help to unearth even more walking routes across the borough. Please send the details, directions and photographs of your favourite walking routes via email to newsdesk@halifaxcourier.co.uk. 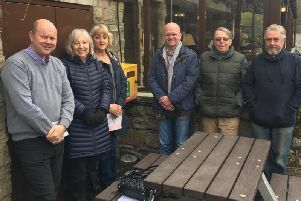 The Calderdale Ramblers enjoyed a five-mile walk last week - the 20-strong group began at the Red Rooster pub, Brighouse, before passing through Hove Edge and Southowram. The group then descended to Cromwell Woods and then on to Cromwell nature reserve and along the canal. Here is your handy guide to organised walks coming up in Calderdale. On Monday, January 19, there will be two walks organised by the South West Yorkshire Partnership NHS Foundation Trust. Meet at 10.45pm at Illingworth Moor Methodist Church, Keighley Road for an easy 30 minute walk. Refreshments will be available after. In the afternoon, from 1pm, there will be a moderate walk of 60 to 90 minutes, with some inclines. Meet at Ovenden Beechwood Medial Centre, Keighley Road. Dogs are prohibited. Call 01422 397340 for more information. On Wednesday, January 21, there will be a walk around Mixenden’s two valleys. Meet Chris Sutcliffe at 10.30pm for this seven-mile moderate walk through the local countryside. Walkers are advised to bring a packed lunch and are asked not to bring dogs. Meet at Mixenden Activity Centre, Clough Lane, Mixenden. Calderdale ramblers will hold a walk on Sunday, January 25. The nine-mile route will explore some of the Bronte Way. Meet at 10.30am at the Bridle Stile car park, Shelf. Email calderdaleramblers@outlook.com for further details. If you are part of a walking group and would like your upcoming events or guided walks to feature in our diary, please email details to newsdesk@halifaxcourier.co.uk.